Although Julius Bissier never actually visited East Asia, the art and culture of old Japan and China were a source of great inspiration for him. His idea of East Asia was made up of the things he had seen, read and heard. Meeting the ethnologist and art expert, Ernst Grosse, and the subsequent introduction to his East Asian collection provided the young artist with an important impetus for his career. The affect on his method of working was radical: oils and canvas made way for ink, paper and small-format paintings. From the early 1930s onward, Bissier’s work became increasingly abstract. His multi-layered engagement with East Asia shaped the realm of his imagination throughout his life. The exhibition at Städtische Museen Freiburg takes up aspects of Japanese aesthetics architecturally. It features over 100 of Bissier’s works – ink paintings and tempera grassa, oil paintings, monotypes and ceramics enter into a dialogue with high-quality original works from Japan and China. Born in Freiburg in 1893, Julius Bissier achieved world renown in the late 1950s. 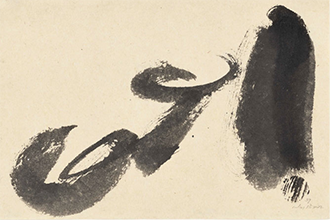 Zen Buddhism and calligraphy were attracting a lot of attention in Europe at that time. As a result, Bissier’s work came into the spotlight and was exhibited worldwide. Exhibition catalogue includes a chapter contribution by Dr Eugenia Bogdanova-Kummer. To find out more about the catalogue, click here.